Champions Rangers eased past the 100-point mark in Scottish League One with victory over Stranraer, whose play-off ambitions are now under threat. The match will be remembered mostly for the minute's silence for former player Sandy Jardine, who died on Thursday. But there were football highlights too, with Fraser Aird the key figure. 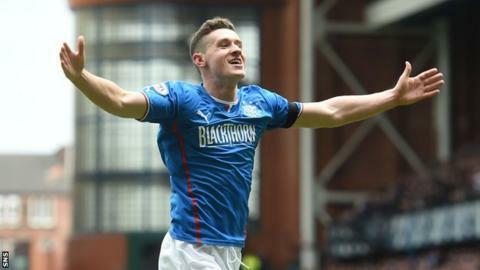 The young Canadian smashed Rangers ahead from 16 yards in the first half and Arnold Peralta and Dean Shiels added to the margin of victory. The match itself was of limited importance to the home side, with Ally McCoist's team having cruised to the League One title on 12 March. However, for Stranraer, there was the imperative of securing their play-off place, a position made less certain by their run of eight games without a win before kick-off. The visitors formed a guard of honour for an unchanged Rangers side from the one that beat Ayr United in midweek. That preceded the minute's silence for Jardine. It was a hugely powerful 60 seconds as the 46,000 supporters remembered the contribution Jardine had made to Rangers with such elan on the pitch and dignity off it. Before any serious attempt at goal, the Rangers fans chanted "There's only one Sandy Jardine" in the second minute to mark the number two jersey worn by the former player. Rangers generally looked composed but somewhat sluggish in the first half and their dominance was rewarded eight minutes from the break, though Stranraer had grown in confidence as the game had evolved. Steven Smith advanced from his left back area to cross for Rangers centre forward Jon Daly, who watched as his header was saved comfortably by David Mitchell. The Stranraer goalkeeper had to work harder for his second save, diving sharply to his left to parry a powerful low Shiels shot from 18 yards. Daly had a shot that deflected off David MacGregor and clipped the top of the crossbar before Rangers took the lead. Nicky Law's pass from a central advanced position found Aird, who quickly cut in from the left and hammered home his seventh goal of the season with a shot from 16 yards that gave the keeper no chance. Stranraer, in yellow, had a fabulous chance to pull level as half-time neared. Sean Winter nipped in ahead of Peralta to head on a corner across the six-yard box, where Frank McKeown knocked the ball over the bar. The home side stepped up the pace in the second half, with Aird instrumental in the improvement. On the hour mark, the young Canadian slid a perfect pass to the Honduran Peralta, who advanced deep into the Stranraer box and finished assuredly for his first Rangers goal. Aird almost made it three when, showing the same sense of urgency as with his opening goal, he controlled a pass and hit a dipping shot from 25 yards that flew a fraction past the post. Shiels netted his 10th goal of the season when he headed Smith's perfect cross at goal only for Mitchell to make an acrobatic save, but the Northern Irishmen was alert to the rebound and, despite lying on the turf, he swung his leg to knock the ball over the line. Substitute Kyle Hutton almost made it four when he thumped a long-range shot off the bar with three minutes remaining. For Rangers, who were presented with the league trophy after the match, it was their 33rd win in 35 league games. With two draws from their other matches, they now sit on 101 points. Stranraer boss Stevie Aitken must galvanise his players in next week's final league match at home to Forfar Athletic to ensure they are in the promotion play-offs, with Ayr and Stenhousemuir pressing them hard. Match ends, Rangers 3, Stranraer 0. Second Half ends, Rangers 3, Stranraer 0. Attempt missed. Ryan Borris (Stranraer) left footed shot from outside the box is too high. Corner, Stranraer. Conceded by Lee McCulloch. Attempt missed. Fraser Aird (Rangers) right footed shot from outside the box misses to the right. Sean Winter (Stranraer) wins a free kick in the attacking half. Corner, Rangers. Conceded by David Mitchell. Kyle Hutton (Rangers) hits the right post with a right footed shot from outside the box. Steven Smith (Rangers) wins a free kick on the right wing. Substitution, Stranraer. Lloyd Kinnaird replaces Mark Docherty. Foul by Arnold Peralta (Rangers). Attempt missed. Frank McKeown (Stranraer) right footed shot from more than 35 yards is close, but misses to the right. Substitution, Rangers. Emilson Cribari replaces Bilel Mohsni. Stephen Stirling (Stranraer) wins a free kick in the attacking half. Substitution, Stranraer. Stephen Stirling replaces Scott Robertson. Substitution, Rangers. Kyle Hutton replaces Ian Black. Lee McCulloch (Rangers) wins a free kick in the defensive half. Foul by David McKenna (Stranraer). Goal! Rangers 3, Stranraer 0. Dean Shiels (Rangers) right footed shot from very close range to the centre of the goal. Attempt saved. Dean Shiels (Rangers) header from the centre of the box is saved in the centre of the goal. Attempt missed. Fraser Aird (Rangers) right footed shot from outside the box is close, but misses to the right. Hand ball by Jamie Longworth (Stranraer). Attempt blocked. Dean Shiels (Rangers) right footed shot from outside the box is blocked. Goal! Rangers 2, Stranraer 0. Arnold Peralta (Rangers) right footed shot from the right side of the box to the bottom right corner. Assisted by Fraser Aird. Corner, Rangers. Conceded by Scott Robertson.